Falling for a honey trap of their own imagining is what over-educated fools do. There is nothing new about the present American belief in the malevolent power of Russia to have penetrated the American mind; that’s to say, American bedrooms, smartphones, chat networks, voting machines, power grids, and most intimate of all, American gun clubs. It’s an old, familiar phantom – the projection of exceptionalists who are being outclassed in their heads and beaten on the ground. Americans believe they will only be desirable if they are over-powering. That’s their honey trap. Between 1968 and 1973, when the American infantry were pinned down by the Vietnamese forces, failing to defeat them with what the US Army and US Air Force thought was their overwhelming superiority of firepower, the ordinary American soldier believed the reason was the inverse of US military capacity. The Vietnamese were winning, the soldier thought, because of their superiority, not only in fighting spirit, but in arms – ghost tanks, ghost helicopter gunships, etc. Since the end of Soviet rule, it was to be expected that Russians would abandon their own exceptionalist ideology and become infatuated by American and European things of every description, including things to spend money on, and safe havens to luxuriate among those things. It’s also to be expected that time is required before Russian things can be valued for their own sake by Russians. Russian painting has taken twenty-five years to recover aesthetic and market demand among Russians. The chronicle of that recovery can be followed here. In November 2015 the London art auction houses combining for the semi-annual Russian Week of art sales reported a record decline in aggregate value of sales and in individual lot prices. 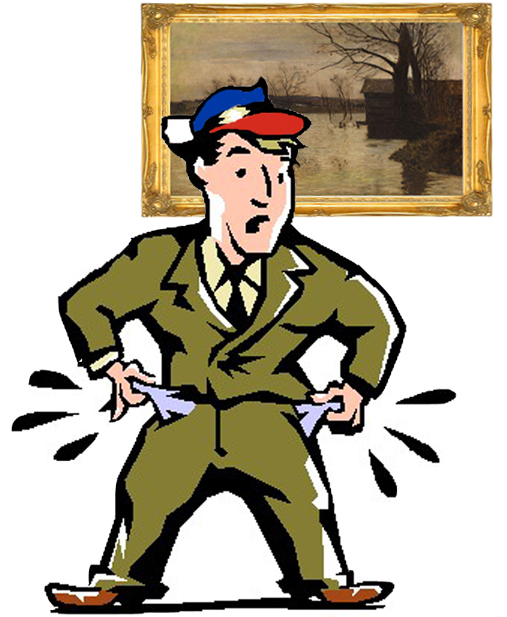 For the explanation of the downward dynamic in the Russian art market, read this. Russian classical music has more difficulty to recover because it lacks countable market value — it can’t be hung on a wall for capital gain, nor traded for profit — unless, of course, it’s a pop tune or a celebrity performer. The market is inundated with the former, so heavy investment is required to generate sales profits; they are exceptional — lossmaking is the rule. Performers like Mstislav Rostropovich or Valery Gergiev have enriched themselves individually, keeping their competition down by the same tactics which oligarchs use. Impresarios go bankrupt, as the case of Vladimir Kekhman illustrates. Producers of classical music on disc or on radio face a dwindling future, although the Russian classical music broadcaster Radio Orfei is defying the trend for its BBC-3 and other western counterparts. Large potential audience, no money to reach its ears — this was also the story of the start of Russian classical music 180 years ago. At that time Mikhail Glinka, employed by the tsar to run his imperial chapel choir, was enjoying the popular success of A Life for the Tsar, the first Russian opera. Nicholas I even gave Glinka a Rb4,000 bonus on top of his Rb25,000 annual salary. 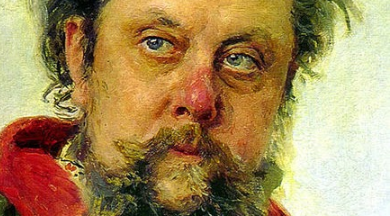 It was also the time – March 9, 1839, to be precise — when Modest Mussorgsky (lead image) was born. In his 20-year career Mussorgsky didn’t earn in total from his music what Glinka took in a single year. 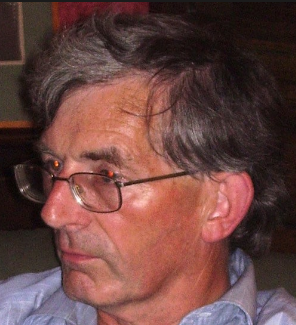 Stephen Walsh (right), an English music critic and professor of music at a Welsh university, has written a life of Mussorgsky’s music which displays oddities. Click to read. These start with his misspelling of the Russian name Mussorgsky as “Musorgsky” (Myew-zorg-skee). This is a mishearing of the name introduced by English-speaking academics whose ears hear the English spelling altogether differently from the Russian sound. One of these pairs of ears, belonging to an American university professor of music named Richard Taruskin, is quoted by Walsh as his authority on Mussorgsky 26 times in his book. Other peculiarities in Walsh’s book include his repetitive prejudice against Mussorgsky’s peer and colleague, Nikolai Rimsky-Korsakov, mostly for earning his living — wait for it — as a professor of music. Rimsky-Korsakov, Walsh opines, spent several months of 1874 “finding new ways of avoiding original composition altogether.” He does concede, though, that in Rimsky-Korsakov’s early opera May Night, “there are beautiful melodies that are pure Rimsky-Korsakov.” He meant Levko’s serenade (“Sleep, My Beauty”). Walsh claims Rimsky-Korsakov’s later opera The Golden Cockerel is less estimable for its own sake, than as a trampoline inspiring Walsh’s favourite, the American-esteemed Igor Stravinsky. Exactly how Russian composers should earn their living is not a question Walsh addresses. He acknowledges that the Russian market for musical performance in the 19th century was monopolized by the tsar and his courtiers, who controlled the imperial theatres for opera and ballet, and also the censor. The ballet theatre doubled as the equivalent of peepshow and bordello for the royal family and their court; just how, read this. The problem of economic survival for Mussorgsky, Rimsky-Korsakov, Alexander Borodin, Mily Balakirev and César Cui – the group of five known in Russian as the kuchka (кучка — bunch, heap) – doesn’t get recognition from Walsh until his second last chapter; by then Mussorgsky was already dead of a stroke brought on by alcoholism. Left to right: Nikolai Rimsky-Korsakov, who died in 1908 aged 64; Alexander Borodin (died 1887, aged 53); Mily Balakirev (1910, 73); César Cui (1918, 83). The problem was that their music never made enough money, so instead of composing or performing music full-time, they had to teach music, or work at non-musical civil service jobs, or both at the same time. The loss of the landed estates of their families in the 1860s, following the emancipation of the serfs, left them with dachas for holidays, but no inherited income with which to pay the bills in St Petersburg or Moscow during the year. Mussorgsky struggled on the wage of a low-level bureaucrat by bunking in with his friends, and by earning his dinner and drinks at playing the piano for small evening entertainments. In January 1880, after he lost pittance-paying posts at the forestry department and the government auditor’s office, two groups of Mussorgsky’s friends offered him commissions, one of Rb100 per month, the other of Rb80 per month, on condition he would finish composing two operas. The first group wanted Khovanshchina, the second Sorochintsi Fair. The commissions were mutually exclusive; it’s not clear how much Mussorgsky actually received; neither opera was finished when on March 16, 1880, he died. Outside the court theatres and a handful of private, princely ones, there were no paying professional outlets for performance of Russian music. The Russian Musical Society (RMS) didn’t start until 1859; the Free Musical School (FMS) not until 1862. As Walsh reports, their concert seasons were often cut short or cancelled because season subscriptions didn’t materialize and concert ticket sales failed. A performance tour of the Black Sea provinces which Mussorgsky undertook with veteran opera singer Darya Leonova in the summer of 1879 barely broke even on expenses. Two Mussorgsky piano pieces on Crimea are reported by Walsh to have been in their repertoire for the tour; they might be hits today but Walsh dismisses them as “somewhat juvenile pieces”. Listen and decide for yourself and again. The RMS and FMS couldn’t support one, let alone five of the kuchka. The two organizations competed; in the music reviews of the press they attacked each other’s programmes. There were almost no individual financiers of music until the 1880s, when Borodin picked up a Belgian countess to patronize him; a timber merchant named Mitrofan Belyaev started a music publishing company and later a music prize (he had to die in 1903 first); and Pyotr Tchaikovsky started collecting an annual salary of Rb6,000 from the heiress, Nadezhda von Meck. The story of what was happening to Russian painting and painters at the same time was relatively well organized in market terms, more richly patronized, better paid. But then pictures as interior decoration or portrait keepsakes had an obvious advantage over pieces of music. The Russian art market was also so well evolved that painters could count on price ranges for different genres fixed by their associations. For the rise of Russian national realism in painting, read this. There is no mention by Walsh of cross-fertilization, even acquaintanceship between Mussorgsky and the well-known painters of the time. Who called Ilya Repin to paint Mussorgsky in the last days of his life (lead image) isn’t reported by Walsh. Mussorgsky’s piano suite, Pictures from an Exhibition, composed in 1874 and one of his most frequently played works still, was based on works by Viktor Hartmann, a friend of Mussorgsky’s; at the time Hartmann was unknown among Russian painters, and made his living as an architect. Listen to Vladimir Horowitz playing the piano version, closer to Mussorgsky’s composition than the orchestrations which keep coming; in this 1951 recording the wrong notes are Horowitz’s doing. The Russian painters of Mussorgsky’s generation opposed the official Romanov ideology of nationality, autocracy, Orthodoxy. They did that by promoting nationality and implying that autocracy (the Romanovs and the state) and Orthodoxy (the Church and the Synod) were the enemies. Mussorgsky’s convictions were the same; he expressed them in music, including folk songs which were pre-Christian in his inspiration. Mussorgsky deserves to be remembered for one line, uttered in recitative in an opera he abandoned, then restored in Khovanshchina: “Have you gone mad?” yells a character across stage at a priest. “Do you want to build over the whole of Russia with your churches?” This is still a radical idea scarcely to be voiced in the Russian press (particularly not in the American alt-media supporting Russia). 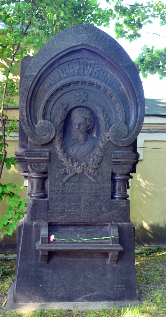 There is no crucifix on Mussorgsky’s tombstone (right); there are on Glinka’s and Tchaikovsky’s tombstones; icon images on Rimsky-Korsakov’s. Mussorgsky wasn’t impressed by the defeat of the Russian Army in the Crimean War nor inspired by its victories in Turkestan and Bulgaria. Instead, after one of Vasily Vereshchagin’s paintings from the Turkestan campaign, depicting a Russian soldier’s corpse abandoned to the birds, Mussorgsky wrote the song, Forgotten. This performance by Alexander Vedernikov, accompanied on the piano by his son, was recorded in 1982. 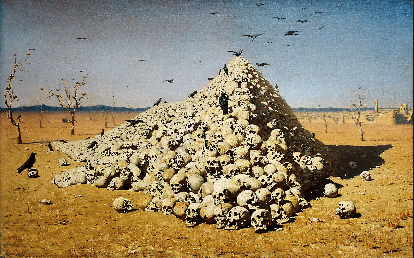 Another of Vasily Vereshchagin’s paintings of the Turkestan campaign, Apotheosis of War. The commanding general of the campaign ordered the pictures removed from public exhibition for their lack of patriotism. What Walsh gets profoundly right is Mussorgsky’s future in Russian music. This started with his idea of realism; by which Mussorgsky meant setting the sound of the spoken Russian language to music. Mussorgsky explained this in his own words: “I’m working on human speech [and] I’ve arrived at a melody created by this speech. I’ve arrived at an embodiment of recitative in melody”. Mussorgsky demonstrated he was a democrat and an atheist in those Russians whose speech he selected. Not only his settings of poetry by Pushkin, but of folk tales and many varieties of ordinary speech – nannies, mothers, children, soldiers. For the stage he preferred mythical boyars and tsars of dynasties long before the Romanovs. To avoid the censor, his evil characters (like Rimsky-Korsakov’s) are witches, devils, and magicians. For the future in Russia of this music, let your ears be the judge. Start with Boris Christoff singing the Nursery cycle which Mussorgsky composed in 1868. Then listen to Yevgeny Nesterenko singing the song sequence of mid-1874, Sunless. In the 1960s, the heyday of concert-hall recitals of Mussorgsky’s songs, Alexander Vedernikov; Boris Christoff; and Yevgeny Nesterenko. And finally, Nesterenko singing the Songs and Dances of Death, which Mussorgsky composed in 1875. After listening to this music, there can be no mistaking Mussorgsky’s musical Russianness. Too original, perhaps, for now.